לפני כמה שבועות דיברתי עם אחד השכנים שלי, חקלאי שמגדל פירות בעיקר. ושאלתי אם יש סיכוי שהוא יגזום את העצים בקרוב, והאם אני אוכל לקבל קצת מהעץ הגזום. בדרך כלל החקלאים פשוט שורפים את זה וחבל. אז אתמול בלילה אני מקבל טלפון מאחי, החקלאי (שהוא חבר שלו יותר מאשר שלי) התקשר ושאל אם אני עדיין מעוניין - בודאי אמרתי, אני תמיד רוצה עץ. העץ הוא עץ לא איכותי, מדובר בעצים חולים כנראה שהיה צריך לחסל לפני שיפגעו במטע, אבל למחרטה לא איכפת איזה עץ נמצא עליה... כל עוד שהוא יודע להסתובב. כמו שכתבתי בפוסט הקודם, האחרון באנגלית לאתר זה, החלטתי להתחיל לכתוב כאן בעברית. אני מרגיש שחובב חריטה ישראלי (או דובר עברית בלבד) מתקשה למצוא ברשת חומר רלוונטי על התחום, והחלטתי להקדיש את הבלוג הזה לטובת העניין. אני לא חרט מומחה או משהו כזה, אבל עוסק בזה כתחביב כבר מספר שנים ולמדתי קצת מהטעויות של עצמי - אז את תובנותי והגיגי אני אחלוק איתכם כאן. השם הוא תודות לידידי היקר, עידו מוהר שעזר לי למצוא את הדומיין הפנוי. האתר כולל מספר איזורים ופתוח לכולם לקרוא ולתרום - חינם אין כסף. Also I'm thinking about ditching this blog and writing my content in Hebrew from now on, the truth is I feel more comfortable writing in English but the fact is the need for woodworking/woodturning content in hebrew is HUGE! I can't think of a single blog/website that actually discuses woodturning in hebrew (even the ones that claim to leave more unsaid and hidden - including the so called Israeli association for woodturning website is practically empty). This is a void that needs to be filled and maybe I can contribute in a small way to making woodturning a more accepted art/hobby in Israel as a result. So the blog isn't going away it is just going to be written in Hebrew from now on. The movie explains it all, I am showing this here because of my interest in tool making - seems appropriate (as well as the shaping,sharpening at the end of the movie). This is a 5 part series, the condensed version (1 includes all) is below, and the full version links underneath. How could I miss this one? Have a look at the following link, it's a blog I just discovered a few days ago. I just had to read the whole thing back... Very, Very! nice. This is how an experience like ITE should be documented, it is so fitting. I just wish there could be more of this - but I guess Lynne had to do some work - how could you not with that creative atmosphere around you (I have more to say about this, but later). ITE if you don't know what that is, is something I would like to be able to attend one day (when I become proffesional enough, and can devote the time required...) you can read about it here. And now drum roll, Lynne Yamaguchi read from end to start, or from start to end, also you can visit her website. OK, browsing youtube and looking for interesing woodturning videos for me and of course for all of you... For starters here are two neat ones. In the last month I've done many more ceramics than woodturnings (although I did use the lathe to make some nifty handles for the wire cutter). I begin to realize that I have a very low self moving factor (smf) - meaning that I won't move if I'm not forced to. I go with my wife, and it's a pre-paid sort of thing, so there is a money loss factor and also my wife literally pushes me out of the house to get there on time. The working atmosphere and conditions, there are other people working next to me, some are worse, some are much better - and it is a motivator to just do something, anything... also the air-conditioner helps a lot - seriously, I don't know how many of you ever visited Israel in the summer - IT'S HOT!!! This got me thinking that I have to fix these conditions in relation to my wood related hobbies, since I like it more and want to practice them more. Well, thinking a bit more made me also realize that the fixing the first condition is very hard - it means setting up a club or something similar in the near area, and make it have weekly gatherings of shop work, where you and I know that wood turners like to TALK and a lot... so I decided to let that rest for awhile. So I’m starting to save to build my lathe a proper home. The place is selected (or dictated) and comes free, all that is left is to save the required funds for the building… I will try to start planning space here, and share the dilemmas and decisions with you, it will be expensive but I hope worth it. Pictures and stuff to come later…. My wife wants a salad bowl, I don't have a lathe large enough for that, and anyways she likes the clay ones better - so she decided to join the course so she could make one, I tagged along to see if it would be as fun. Clay is interesting to work with, this course is focused on hand work and not on working with a wheel (naturally I'm more interested in working with a wheel, so I was a bit disappointed, but the teacher said that if we really wanted she could bring a wheel to the next lesson, I'm waiting.). She taught us two techniques that she uses to create pottery. and then we each got 10 pounds of clay and were told to get wild with it... do what we want and express ourselves. As could be expected everyone started making some sort of a round bowl, I decided to go square, in wood turning I always work in the round (even if creating eccentrics or therming, you always do a stage in the round), I thought it would make an interesting change. As we worked along the teacher focused us on some of the pitfalls of pottery which all center on the transformation of the wet clay in the oven into the finished product - air pockets, support and air pockets again... I had a good time, and I will continue for awhile, hopping she does bring the wheel next time. Now two or three items in the list are obviously superior to wood turning (I leave it to you to guess which ones) but the others are not that much more important to me. So I have to wonder why I don't turn so much these days (more like don't turn at all). This might seem petty to you, but the truth is that *starting* to turn is my problem, my workshop is a cramped little plastic shed, and I feel cramped and prodded in there. every time I think about turning - I get that stuffy feeling and can't bring myself to go there at all. True, I've seen shops that were worse than mine, and people make do and create beautiful objects - I know this is MY limitation. So I decided to invest in this, to eliminate this blockage (money can be the answer sometimes :-)) - I'm saving to build my real place... I have the land to do it, so there is nothing to stop me - once I collect the necessary funds this is a go! Hopefully, in a few months this will be getting underway - the Eshel Studio (also collecting for a table saw, radial drill press and router + table - heeheehhee). 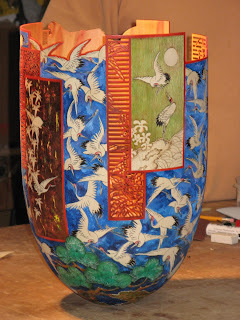 I just got word from Eli Avisera that Binh Pho will be coming to Israel for a day and do a day long demo in his studio in Jerusalem! This will happen on May 27 2007. 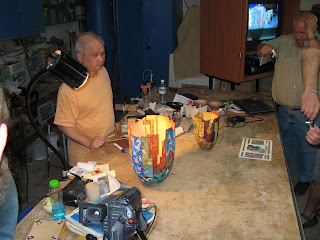 Binh Pho is a world famous wood turner, who has amazing technique for creating very thin walled turnings and then adding to them piercing and color with an air brush, until today I've only seen him in pictures. This should be exciting! For more details you can go to Eli's website, there is a phone number to call and reserve a place for yourself! I definitely plan on being there, and probably will post afterwards on my experience. לפרטים כדאי לגשת לאתר של אלי אביסרה ולהתקשר לטלפון המופיע שם ולשמור לעצמכם מקום. מספר המקומות מוגבל. I don't have much to contribute to this post, not being much of a turner yet, but I like what Darrell is doing on his blog, and how he's showing his thought process combined with the actual work done on the lathe. Not long ago I decided I wanted to try the whole inlay thing, specificaly inlaying different materials in the turned work to add some color and contrast. This is a long practiced skill, that has had several books written about and you can see quite lovely examples of in many websites. Having CSUSA a bit far from Israel and also a bit expensive, I decided to go look around in some local stores for inlaying material. We don't have a turners supply store here, but we do have hobby stores, which cater mainly to little children activities (painting, creative stuff) and jewlery making and other such popular hobbies. I was looking for inlaying material, and found some glitter dust and also colored sand in many colors. I bought a small amount that should last for many attempts. I think my favorite passtime / torture is probably browsing tool catalogs (printed are easier to the eyes, but I browse online ones too). Why do I? well, it should be obvious - I NEED tools, DUH! Well at least I think I need them... Maybe want is a better word, my hording nature comes to light. This is not a private problem, it is a global one, there is not one woodworker/wood turner (add metalworker, or just about any tool using profession/hobby) who would tell you that he didn't NEED this or that tool, that is the reason that so many toolmakers exist, and also why they cost so much (of course there is quality and stuff). That's why I decided I shouldn't buy, well at least not until I am swimming in money. 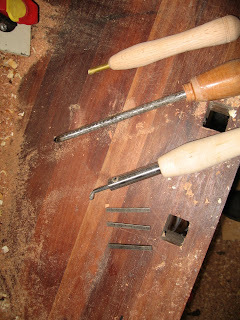 I will attempt to make... Making tools isn't so easy, well sometimes it is, depends on what you need, tools that would cost $50+ can be made for much less (if you don't factor in the looks). 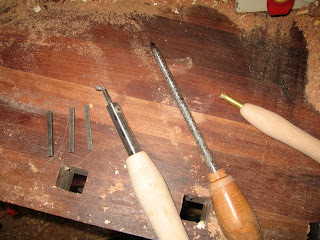 My candidates for making are tools for woodturning mainly, but I would also like some carving tools (gouges and knives). 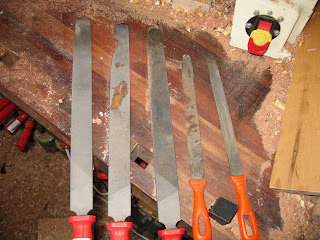 I learned a lot from the various forums and especialy from Darrel Feltmate http://www.aroundthewoods.com), Also I bought an interesting book that claims to teach the basics, "Make your own woodworking tools" by Mike Burton, I read it a couple of times already, and I have to say I like his attitude, basicaly "How it looks doesn't matter, it should just do the job!" I have yet to actually do something based on that book, to this date all my home-made tools are HSS bits that I sharpen and place in a handle piece, and some files that I grinded to make some scrapers and gouges (this was done before I read the book, but it is fitting to the book motto). My scrapers made from files, these actually work pretty well, they do need sharpening pretty often, but hey, a large file costs very little and doesn't take much work to grind it to a scraper - this size and weight scraper could cost $80 if you buy a brand name. 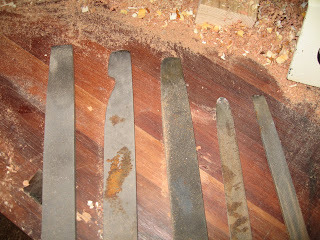 Close up on scraper tips, left to right, square edge, side cutter, round corner - left, round and small square. I might have mentioned before that I own a Jet Mini lathe, this is a sweet little lathe which is quite fine in its own way. I have also invested some money in after market accessories that are available specifically for the Jet mini. As I said it is a very good lathe, but it's a bit limited - you can guess - it is a mini lathe, and can turn only very small items. Anyway the money is mostly raised, and now I have to decide what to buy. You must realize that I'm not talking about anything in the range of a Oneway or Vicmarc (the $5000+ USD range), but obviously much less than that. The range of cheap chinese lathes, the sub $1000 range. In Israel you can't really get anything else for that price. Now the dillema is as follows, buy now for the money I have. Get a not so good lathe that would probably do a decent job for what I want (bowls, platters) OR wait for an undetermined period of time and then buy a serious lathe, that would serve for a long time. Currently I'm out of a job, so this will have to wait in any case... What do you think? The arguments are pretty obvious... Oneway/Vicmarc/Other Brand Name are good solid lathes that I will never regret purchasing (while I just might regret purchasing the chinese ones for various reasons). On the other hand if I buy the chinese one, I will be able to turn large bowls quite soon, and still have money left to but some much needed accessories (bowl saver, chucks, etc...) , also it is not that big an investment, and I will have those accessories ready if I ever buy the Oneway (they'll fit it too).